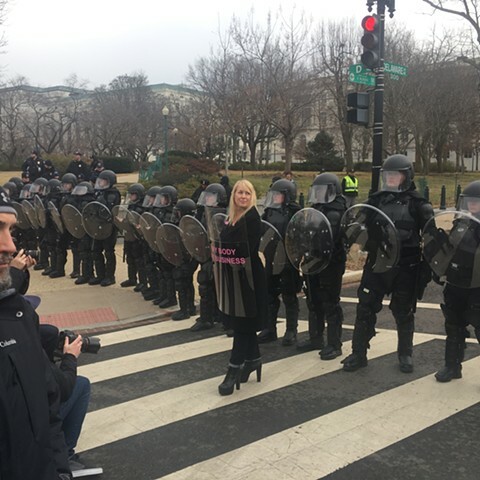 On January 20, 2017 I carried a modified, full-sized police riot shield to the inauguration day protests in Washington DC. The shield, emblazoned with the slogan, My Body My Business, is a call to defend and advocate for every womans right to determine what to do with her own body and to the safe, affordable health care that enables that right. By carrying the shield in the protest, I also want to invert the historic symbols of oppression that the militarization of our police forces have made far too common. Instead of an offensive weapon in the hands of government, my shield will be a strong, transparent symbol to rally the popular majority in defense of the progressive cause.